My red claw molted last night and came out with white spots on legs and claws as well as a white bad across the tail at a joint. I am wondering if this might be the white spot fungus (possibly caught from the feeder shrimp I buy at the local pet store). Yabbie is about 3years old now. He lives in a tank with a few other small fish. I guy glass shrimp and sea monkeys once a month or so. I was just wondering if there was anything I could do to help him, or if it’s just a sign of his age. Unlike your grandfather, shrimp do not get spots as they age. This is plainly a sign of infection, though what your shrimp is infected with is debatable without seeing him in person. If the disease came from the feeder shrimp you purchased it's most likely a fungus, possibly Topicalis albinus, better known as White Spot Disease. At the time of that article, however, I stated that tetracycline would be ineffective since it only treats bacterial, not fungal, infections. New research (Giles 2007) suggests that tetracycline does indeed have efficacy against albinus, though the mechanism isn't yet understood. Tetracycline is a safer possible solution to White Spot than copper, which is hazardous to invertebrates. To administer the tetracycline, simply grind the pills using a pill grinder and mix the powder in distilled water, adding one drop a day to your aquarium using an eyedropper. If your cray has holes in his shell from his infection you might want to inquire about Actisite, a thread-like fibrous form of the drug usually used in dentistry; it make have similar applications for crustacean shells. Though tetracycline is generally safe, one side-effect is that it causes keratin, found in bones and hair, and chitin, found in arthropod shells, to glow under UV light. This isn't a negative, however, as adding a UV to an aquarium is cheap and you and your family could become the envy of the neighborhood with your glow-in-the-dark yabbie. I had an arthropod physiology class and in it we discussed Marmokrebs, a crayfish that clones itself. Apparently it is taking over fresh and brackish water systems in Germany and there is fear that it will overrrun Europe unless a way is found to stop it. How is it possible there is a cloning crayfish? I am curious about this topic, many thanks for answering my query. This crayfish species, named for its marbled shell, has raised debate in astacology recently, as each and every specimen of Marmorkrebs is molecularly identical; that is, each Marmorkrebs is a clone. Its origins are just as mysterious as its genetic pool, with Marmorkrebs only discovered in the Nineties. It still lacks a scientific name until it can be placed within a genus. Marmorkrebs reproduces in three unique ways, setting it apart from not only other crayfish but all other crustaceans as well. On a regular cycle it goes in berry, holding a clutch of up to one thousand eggs for just over two weeks. The eggs are fertilized although there is no male contact — all Marmorkrebs are also female. 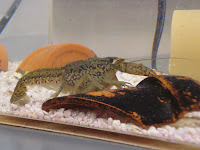 The eggs then hatch and the craybies grow just as any other crayfish young. The Marmorkrebs also buds, where during a series of several molts in the Summer months extra body parts grow and, at the end of the cycle, a completely new Marmorkrebs splits off and lives indepdenently of the original organism. This is a method employed by simpler organisms, including several classes of worms, sponges, and hydras as well as microorganisms like bacteria and fungi. Analysis of Marmorkrebs DNA reveals several sequences, particularly in genes controlling reproduction, that are unique among Animalia. Research continues in placing Marmorkrebs within crayfish taxonomy, with one Dutch researcher commenting that the DNA is unusual for a crayfish, let alone an arthropod. Further study will unlock the secrets of this exotic, mysterious new species. In the meantime most Western countries have placed a moratorium on the shipping or sale of the species due to its potential as a nuisance species, though China is investigating it as a cheap foodstuff.